Are you interested in volunteering for Hamacon Minicon 2018? If so, we have the information for you!!!!! 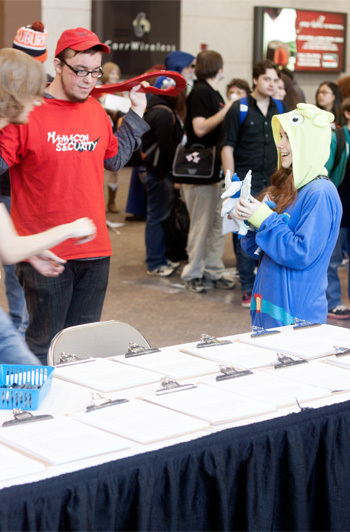 We are super excited for another year for Hamacon and as always, we are asking for our amazing volunteers to help us and make it the best yet! OK! I want to staff! … Now what? All volunteers are required to attend 2 of 3 meetings AND attend the Mandatory Staff/Volunteer Meeting. Security, Techs, and the Cafe Maids may be required to attend an additional meetings held by their directors on top of those already listed above. If you are NOT able to make it to the required meetings, or have any questions, please contact volunteers@hama-con.com! Please remember to bring a pen. Must have reliable transportation. Meetings will last about an hour for those being picked up. To volunteer you must be 18 or older. If by some chance you miss the meetings and YOU JUST HAVE TO VOLUNTEER, email us at volutneers@hama-con.com.